Today in hockey history, a historic team is founded, a player sets a record just by playing, a goalie sets a franchise record, a lot of games are played, and a crazy fact with its own plotline that could probably have its own article. December 4, 1909 – The oldest still-operating NHL franchise was officially found, as J. Ambrose O’Brien and Jack Laviolette created the “Club de Hockey Canadien,” or as we know them today, the Montreal Canadiens. As you SHOULD recall from a previous TDIHH, O’Brien is credited with founding the NHA, which led to the NHL 10 years later. December 4, 1963 – In a 2-2 Bruins tie with the Black Hawks, Boston’s Andy Hebenton set a new NHL record by playing in his 581st consecutive game! That’s basically seven seasons of not taking a single game off. He broke the record held by John Wilson, though Hebenton’s record was eventually broken by Doug Jarvis, who played in a ridiculous 964 straight games. 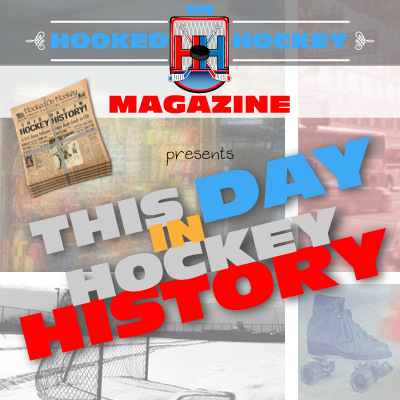 December 4, 1987 – The Red Wings beat the Blackhawks….12-0. Come on Chicago, have a little self-respect; they managed just 19 shots as well. Tim Higgins scored the only hat trick of his NHL career and Steve Yzerman had two goals and two assists. December 4, 1988 – Edmonton’s Jimmy Carson followed in his alumnus’s footsteps by becoming just the third player to score six NHL hat tricks before the age of 21. That’s pretty damn impressive. He also had an assist in the Oilers 10-6 win over the Rangers. And he did it without the aforementioned Edmonton legend, who was traded to the Kings in the previous offseason, so he was not only following in his footsteps but also trying to fill the shoes that made those prints as well. If you can’t figure it out, I’m talking about Gretzky, who scored more than six hat tricks before hitting age 21. Want to make it even weirder? Carson was actually involved in that trade that sent The Great One to LA! And, believe it or not, Carson actually beat Gretzky at something – he scored more goals as a teenager than any other player: 92! That’s incredible! (And, just to make it weirder, 92 is the record for goals by one player in a single season, set by Gretzky!) The only player to have reached the 100-goal milestone at a younger age than Carson, who hit that mark at 20 years and 116 days? Gretzky, who was 20 years and 40 days old. And Carson himself was aware of his situation, too, as the pressure of being expected to replace Gretzky became too much and he demanded a trade. His wishes were met, and he was traded to Detroit after just four games in 1989 (one goal), and although his expectations were gone, so was his talent: he’d score just 133 more goals in seven NHL seasons. December 4, 1996 – Patrick Roy stopped 36 shots in the Avalanche’s 2-0 win against the Oilers for his fifth shutout of the season (35th of his career), which was actually a franchise record for one year (in Quebec’s/Colorado’s 17-year history). Yeah, keep in mind that we’re still in early December; there was a lot more season for Roy to pick up more shutouts…although he only recorded two more for the rest of the year. December 4, 1999 – The NHL had its busiest night in league history, with all 28 teams playing games. The Blue Jackets and Wild would enter the league the following year.